A close friend of mine, since the 7th grade, sent me an email. She’d noticed I’d not been posting much on Facebook or this website. She was a little concerned and wanted to know if I was okay. I really appreciated her inquiry and let her know all is fine, that I’ve been busy. We’re up in northeast Georgia visiting my 88-year-old father-in-law, Ray. With Ray, you can be assured you will be busy. By busy, I don’t mean taking care of Ray. I mean keeping up with Ray. Every day starts before sunrise. Then, he’s working, for example loading 50-pound bags of feed onto one of his trucks. Naturally, I’ve got to pitch in or he’ll make me look bad. Once, I wasn’t paying attention, I’d been shooting, and discovered he’d loaded 500 pounds of corn into the bed of a truck whileI was gone. Granted the bags only weight 50 pounds each but part of the effort meant hauling each one about 15 yards from where they were stacked before throwing them into the truck. That corn was then driven to his hunting property where we loaded it on ATVs and distributed it over selected areas located throughout his 800 acres. The ATV trails are a bit rough and there was a good bit of bouncing around involved during the delivery. There was, also, tractors to be dealt with, trailers to be attached (big trailers) and detached, fields to be walked and discussed, trail cameras to be checked and reloaded, and more bags of feed to be purchased, loaded and distributed. Ray had handled the second feed purchase, 450 pounds by himself. 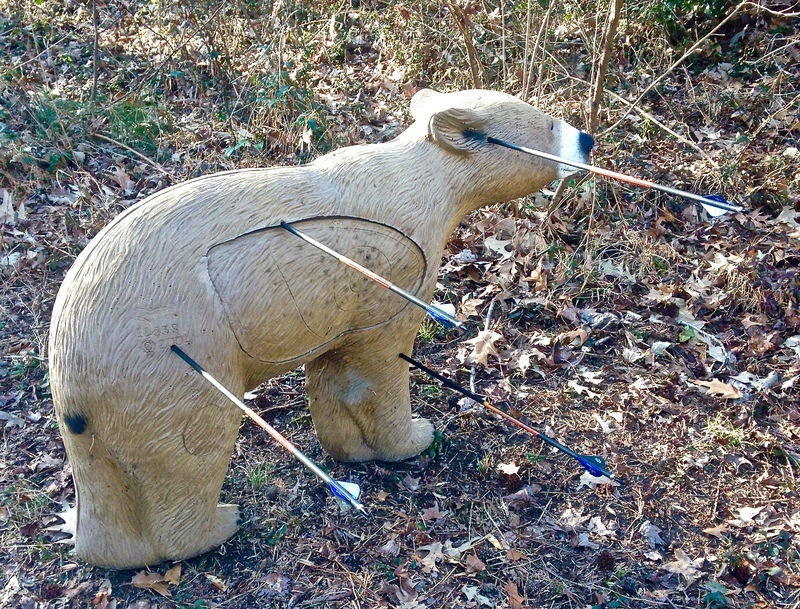 I’d have helped, but I still needed to work archery practice and was unaware he’d left to get the feed. Running means out at the ‘puke of dawn’ for River and I. 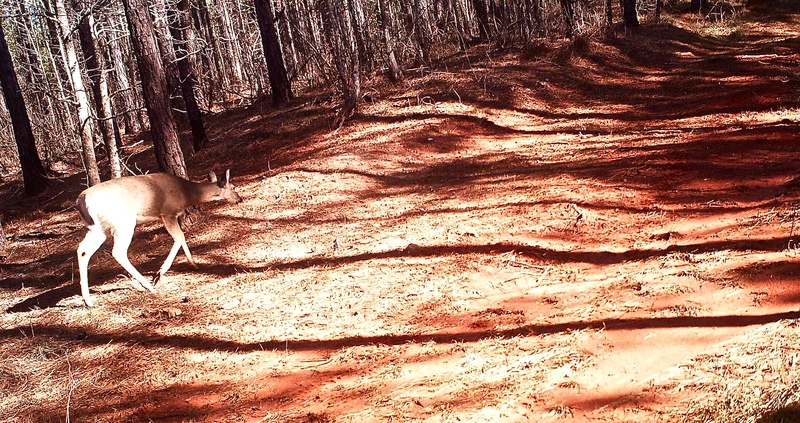 Going through the woods to distribute the feed, Ray ride a John Deere 650cc Trail Buck. I was driving Polaris Crew because I was carrying the feed. 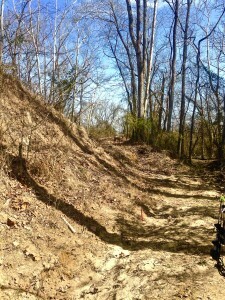 Once we’d finished we headed back down trails to where we’d parked the truck. Ray drove off first. 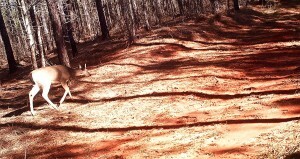 This was a decent trail with only a few pits, bumps, logs, and mud holes to transverse. Ray had a few seconds head start. When I say seconds, I mean seconds. 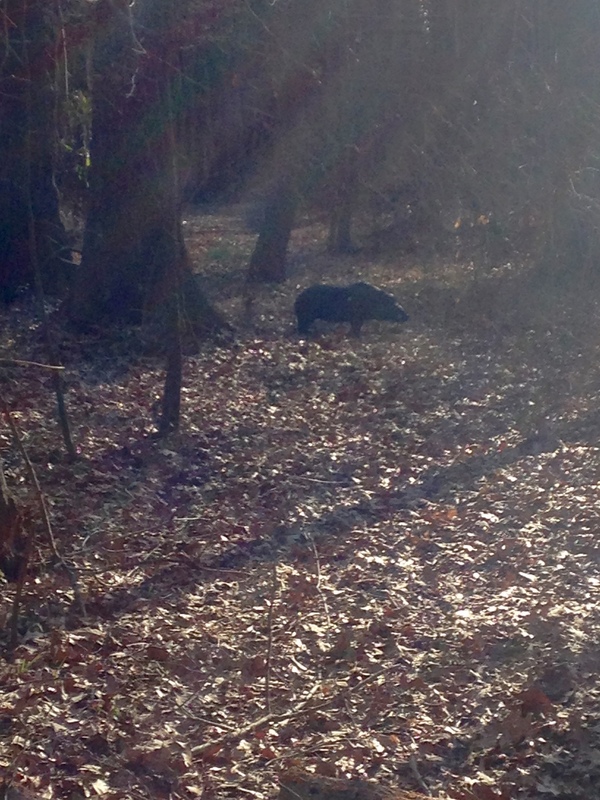 I could see him twenty yards ahead. 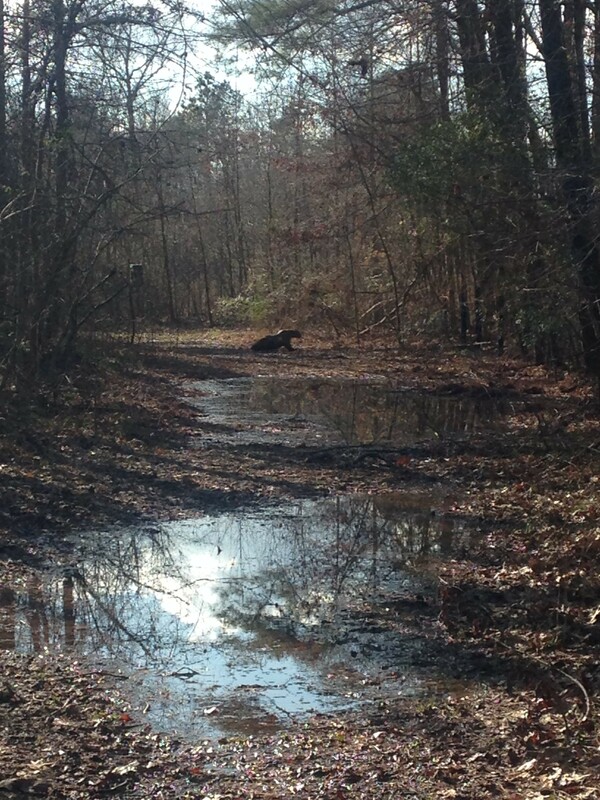 I want to say about twenty yards away so the debris that blows back from his ATV doesn’t end up on me. There was one left hand turn. When I made that turn, Ray was gone. Not just way ahead, gone out of sight. I was, in spots, going 30 mph. The next time I saw Ray he was standing near his truck talking with Bruce and his son Jeff. Bruce had shown up to do work on tractor accessories – plows, etc. 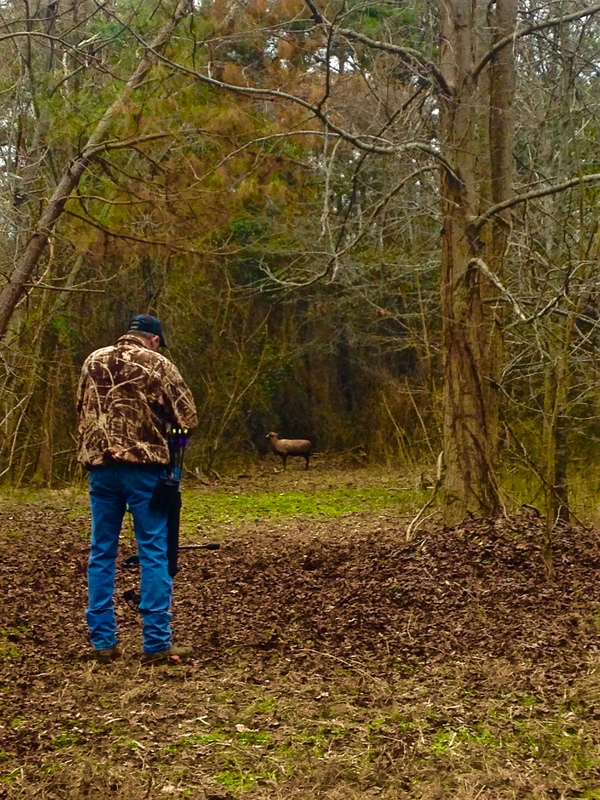 He is also getting instruction on where to move tree stands, plow and clear land. That turned into an hour of instruction. What I remember most is that I was starving and ready for lunch. Ray seemed impervious to fatigue or hunger. Anyway, Cathy, my friend, all is well. 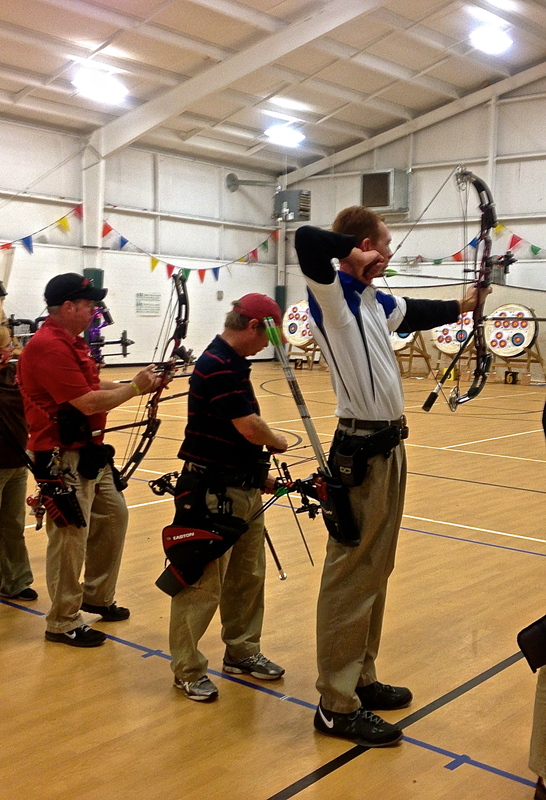 The 3D season started with a warm-up on an indoor 3D shoot taking aim at tough, small, well-distributed targets. I’d won the event. Even so, it had been close with me earning 214 points and the second place archer taking 208 points. Still, this had been a range where, in the past, I hadn’t done better than second place. I felt strong going into the main stream of coastal North Carolina 3D. Over the winter I’d done a lot of practice shooting 3D. My long shots had been over 50 yards and my shortest ones against a mosquito. Overall, my practice had, in my mind, replicated what I might see in regional competition. That competition began last weekend at Lenoir County Archers and Pitt County Wildlife Club. Lenoir County is nearly 3 hours from where I live. It was the first of the two shoots for the weekend. I’d gotten up early, fed and played with my dogs, loaded them into my Ford tF-150 and arrived just at the opening of the 3D day. Despite my early arrival what I observed was the range beginning to back-up. To make timing worse, I needed to find a group to join. It didn’t take long before I was teamed up with Chad, his son Chase, and Willis. 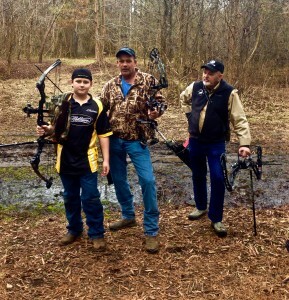 Chad a youth shooter and his dad, in the Bow Hunter competed a bit closer to the target than Willis and I.
Willis is an elite archer that has competed in the US and Europe while a member of the US Air Force archery them. He’d been off the circuit for the past few years while recovering from a heart attack. In fact, Willis had not picked up his bow for during the past 3 years. He said he’d only come out to sight his bow and perhaps shoot a bit for fun. He was so interesting and experienced I pleaded with him to come shoot and he agreed. We left the warm-up range, paid our registration fee, got our cards and headed to the first stake – I still felt confident. 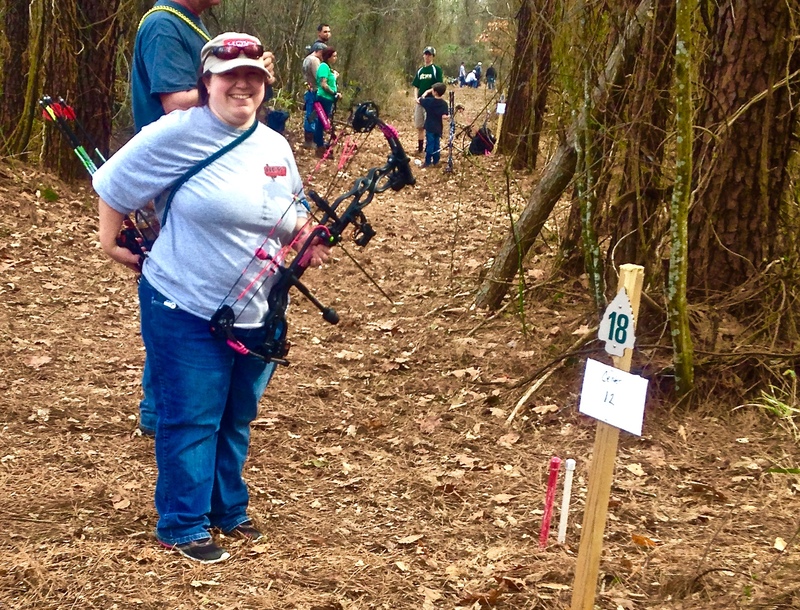 The Lenoir County Archers have a lot of real estate for their range and they are not shy about using it. 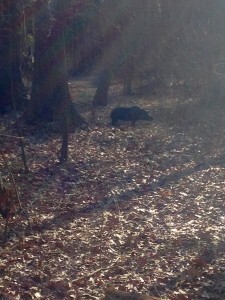 At Stake 1 the maximum distance (for me 45 yards) was, well max’ed out. Scoring on that shot left me somewhat less confident than I was when I walked away from their warm-up range. The day didn’t get much better and I was happy to come out of the woods with the same number of arrows that I’d entered. Willis, also shooting from a max of 45 yards and despite having not shot in three years quickly regained his form. There was a well-rehearsed often-practiced method to his shooting. Watching a truly elite archer go through the motions was educational. Chase and Chad shot well. Chad shot better once he’d gotten his windage properly set. But, dad won the day – the first time in awhile he’d taken the prize over his son. There was a bit of good-humored father-son teasing they went on following dad’s infrequent victory. 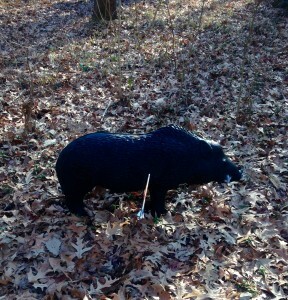 Stake 1, Chad at 35 yards. The first of two days had me reeling with poor yardage judgment and finishing among a packed field in 4th. Day two, well I felt confident, again. I shot some of my higher scores at Pitt County and was looking forward to redemption. I’d hoped to shoot with Willis, again. Sadly, he’d already hooked up with three other archers and was heading to Stake 1 as I was beginning to warm-up. He invited to join them, but I think 5 in a group is one too many. It slows down the group and other archers. I lucked out and team up with Zack and Tyler. Both are great shooters and compete for their school as well as independently. I’ve known Zack and Tyler for a couple of years having met them shooting 3D with their Coach. I’d not seen them since last season and like many 16 to 17 year olds Zack, now 17 had gone through a growth spurt. He’d sky rocketed 8 inches in one year! The young man had become a giant. Two 10s and a 12. Our team was shooting pretty good at times. One of his concerns with his new size is arrows. 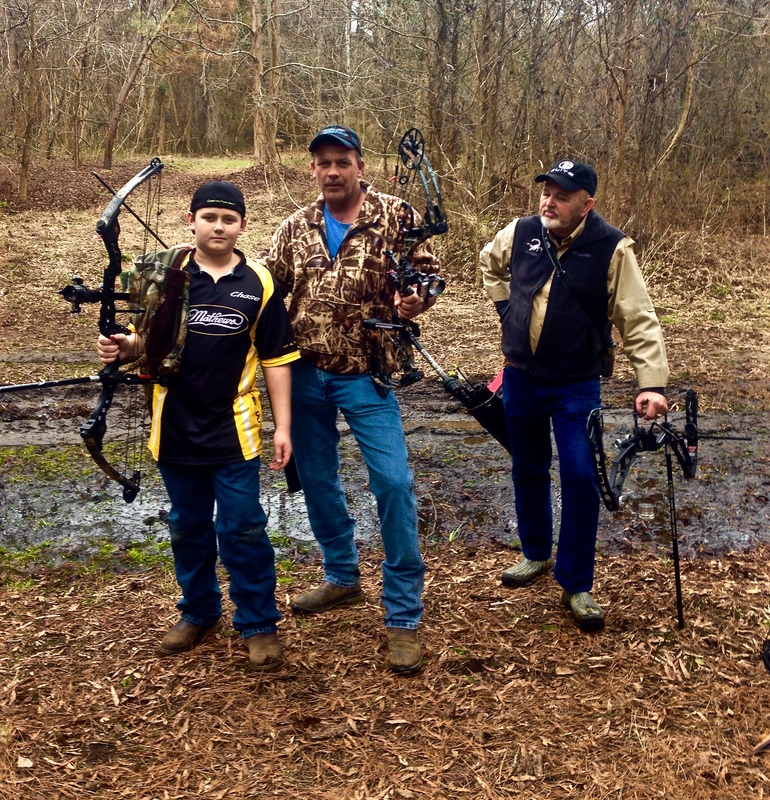 At 17 he already has to shoot 32-inch arrows and is a little concerned about finding 34-inch arrows. They are available but not common. Along the way we played through where possible. Zack and Tyler had school archery practice and needed to leave the 3D range and get to school by 2 PM. As slow as day 2 turned out, I’m sure they were late to school practice. A bonus is I ran into a friend, Maria. Maria lives in Raleigh and had made the drive to the coast with a number of her friends. It was great to see her and one of the highlights of the weekend. Something not as much of a feature was my score on day 2. Visiting with Maria was wonderful even if it was way too brief. Both days left me a disappointed. On day 2 I finished with another 4th place. The final place wasn’t as disappointing as the drop in my average score for similar distances. The two days of shooting, scoring aside, were great. I really enjoyed both ranges even if they are quite a haul from my house. I’m starting to think a small RV might be a nice investment. The finish on both days was below par for me, there’s now plenty to space for improvement. Saturday begins the 3D season here in my neck of North Carolina. 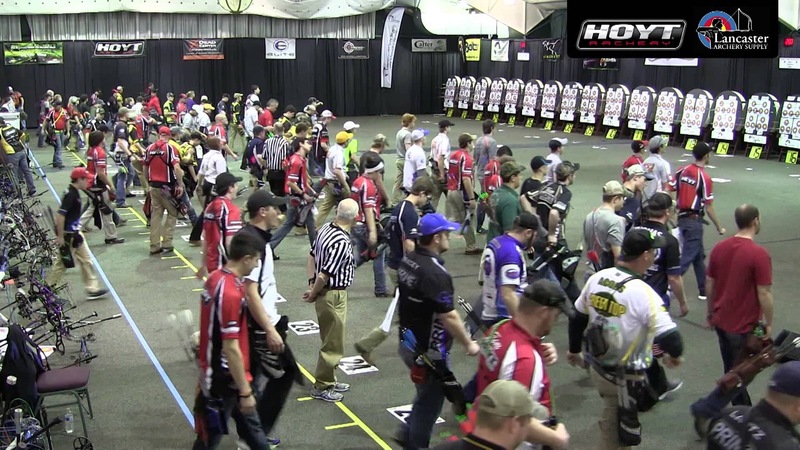 The following week I head to Georgia to shoot two in two indoor tournaments. Hopefully, I’ll find another 3D shoot while I am in Georgia. Friday, I shot outside and didn’t shoot all that well. Then, the yards were assigned to targets 1 through 20 based on the random numbers generated. 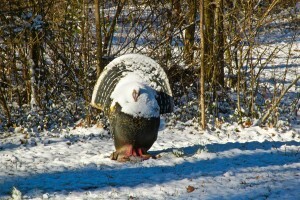 As it turned out target 1, for example, was a turkey at 44 yards. Then, on the range, I estimated the distance for each shot without a range finder. So, at the first target, a turkey, I walked out to what I judged as 44 yards and shot it. I scored a 10 on that shot. I did worse on target eight, having shot all 10’s and 12’s until that point. Eight was a small boar. This time I shot it from the reverse side – not my typical shot. I ended up with a 5. It was a difficult shot where I needed to place an arrow through a small opening in the bushes. The next shot was from 49 yards and I hit a 12, then back to 27 yards on a coyote for a 5 and so forth. It is a little bit backwards to walk the distance first, trying to judge it, rather than walk up to a target and make the call. I didn’t approach the target then walk away while counting steps. I walked the range approaching targets from a tangent. Finding new ways to make 3D more challenging in training, especially on your home range, can be important during a tournament. Moving target around helps. Coming up with ways to make judging yardage ‘different’ should pay dividends later this year. In Archery Maybe it is Best to Follow Your Heart. Practicing the mechanics of archery takes patience and focus. It’s a matter of training your muscles to sense alignment and form while maintaining Jedi-like control. Or maybe all you need to do is follow your heart. Keast and Elliot published a paper in the Journal of Sports Science that measured archers’ sway, aiming time, cardiac cycle (electrocardiac cycle) and the release of an arrow.1 The study included recurve and compound bows. This is what they discovered. Sway was measured at the postural center of the archers’ body and sway varied significantly both within and between two separate trials (the archers were tested twice, 100 days apart). As sway increased the quality of the shot decreased. 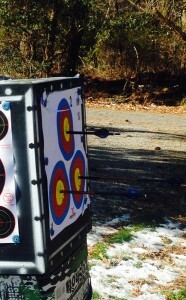 As aiming time increased the quality of the shot decreased except for bare bow shooting. 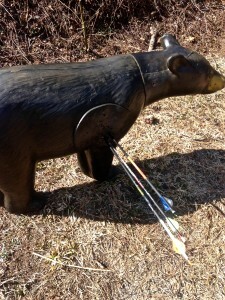 During bare bow shooting as the aiming time decreased the quality of the shoot decreased. Cardiac cycle time was also measured. 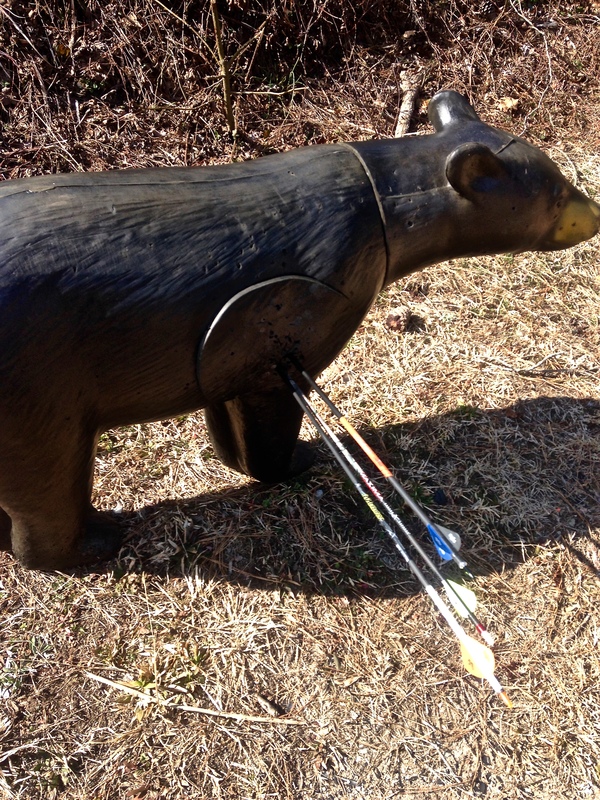 Here they found that cardiac cycle time increased significantly as the archers approached the release of the arrow where there was a good shot. When the shot was bad or average there was no significant increase on the cardiac cycle. 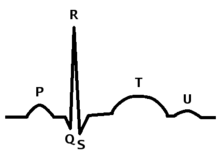 The most consistent parameter related to the quality of a shot was the placement of the first finger movement within the ST phase or mid-cycle phase of the electrocardiogram for arrows of good quality. How does an archer achieve the movement of the finger (to release) within mid-phase of their cardiac cycle? You can’t feel the individual bleeps of your electrocardiogram. I can only explain like this: It is in that millisecond when you sense the target, feel the calm, unconsciously find that instance where everything is blocked other than the target, and then release occurs. It appears that the heart knows when you have it right. 1) Keast D, Elliott B: Fine body movements and the cardiac cycle in archery. J Sports Sci. 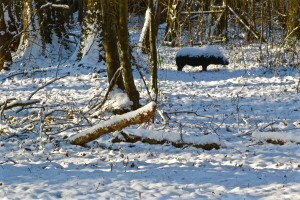 1990 Winter;8(3):203-13. 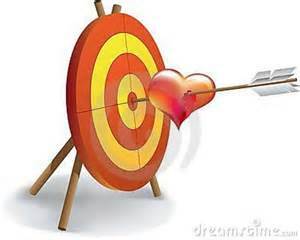 Author David LainPosted on February 18, 2016 Categories Archery, FitnessTags PracticeLeave a comment on In Archery Maybe it is Best to Follow Your Heart. I suppose I don’t recover from working out like I did when I was in my 20s. Well, I know I don’t. Lately, I’ve been on a tear of riding, swimming, lifting weights, running and shooting. On top of that I’ve been hauling lumber and moving loads of dirt. It seems to have caught up with me and I felt it this afternoon while shooting. I try to take rest days. Most of the time I succeed. This morning I didn’t even run that far. 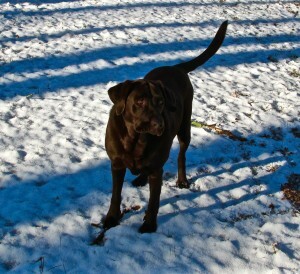 Not so much because I felt tired, Coco, the lab down the road, joined up with River, my lab, and I on the run. With all the rain we’ve been having I knew the two labs would get filthy. That meant I’d need to give River bath. I’d just bathed her yesterday (mud related incident) and was not up for doing it again. 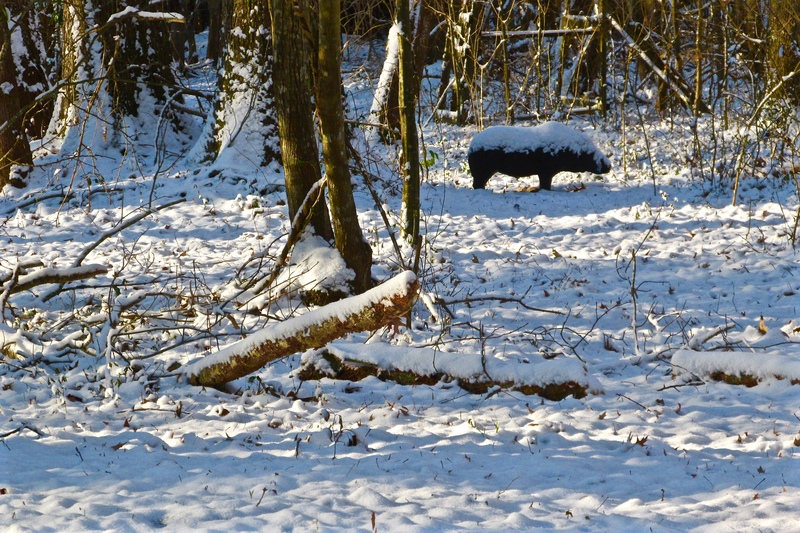 So, I turned around before we reached cresting creeks and over flowing ditches – one that is the last resting place of a buzzard picked deer. If there is water, muck, or mud, these girls are in it. I shot this for 60 yards, it was 57 – yes sir that’s how to earn an 8. Shooting in the afternoon I was on a muddy wet 3D range. I had no gittyup. Still I shot, and ended up 2 down (198 out of 200). It wasn’t so much a matter of not being able to judge yardage. At each target I recorded my distance, shot, then recorded the distance using a range finder. The average distance per my estimate was 32.3; the range finder’s average was 33 yards. 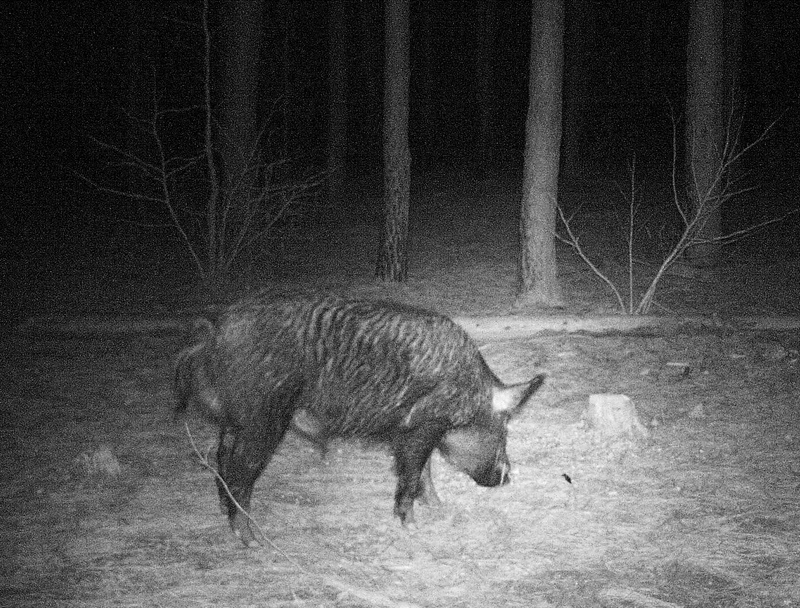 The minimum distance, a mosquito was 18 yards and the maximum distance was 57 yards, a mountain lion. 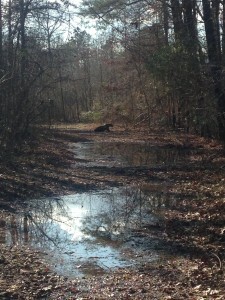 On both of those targets, the distance was one of convenience; water left me very few options regarding where to stand. 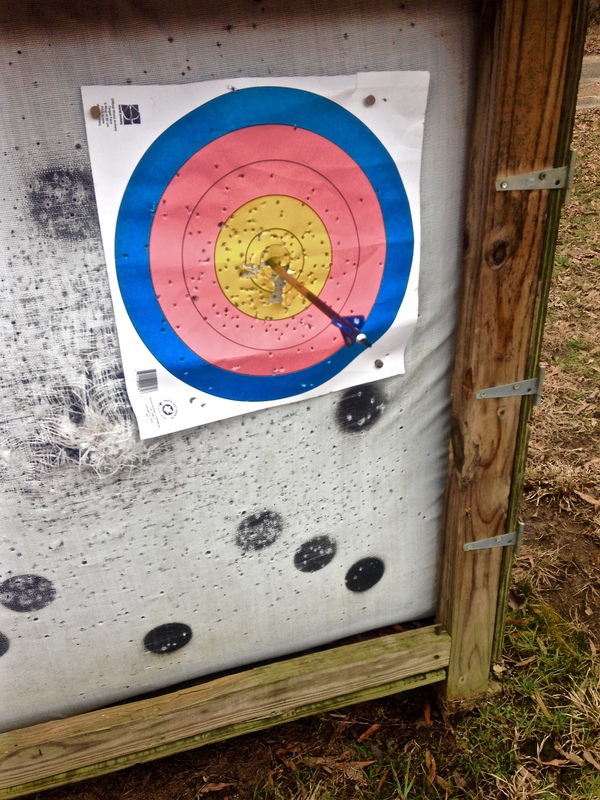 I shot poorly, hopefully, just because I was tired. This mosquito is a tough little bug. To complicate shooting the sun, which can come through the trees because the leaves are down, created a glare on the lens of my scope. I was happy I didn’t lose any arrows. At least two shots were as much of a guess made aiming as I like to make. Amazingly, both of those shots were 12s. I did run this morning, I shot twice, and I will force an easy bike ride in an hour. But, tonight, I plan to have a good nights rest. Author David LainPosted on February 17, 2016 February 17, 2016 Categories Archery, FitnessTags Practice, TrainingLeave a comment on Beat, Just Plain Beat! The above paragraph is from an article that considers how athletes can train to gain peak performance and apply the impact of their central nervous system. It is a good piece of work, especially if you run, jump, ride a bike, or perform in many sports aside from archery and shooting. When I prepare for a race I mentally channel my excitement so that I remain somewhat calm. I don’t want to nervously waste energy – I want to apply it to force whether that force is on the road as my foot impacts its surface or on the pedals of my bike. Shooting an arrow is a different condition where nervous energy is not always a good thing. In the excitement of lining up for a shot, either on the line standing next to other archers or at a stake in 3D remaining calm is important. Shaky arms aren’t beneficial for archers. In the first archery tournament where I competed, the Virginia State Indoor Championship in 2014, during the first several shots, my heart was pounding, and I was very nervous. In fact, I was far more jittery at that State Championship than I was at the 2008 Ironman World Championship in Kona, HI. Why the difference? 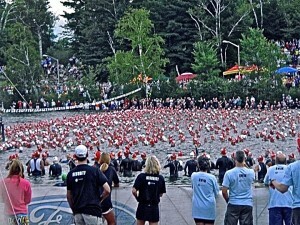 Ironman Lake Placid – yes I’m the guy wearing the red swim cap. One obvious reason, no one was looking at me in Kona – I was bobbing in the water, waiting for the cannon fire that would signal the start of a long day along with 1800 other triathletes. I wasn’t worried about “looking” bad or “stupid”. I knew what to expect from of my performance. I knew I would get a boost from adrenaline and I knew I’d do as well as I’d trained. I totally trusted my plan. Another reason, it wasn’t my first ‘rodeo’ – in fact outside of archery I have competed in over 415 competitive events (including 6 World Championship in cycling, triathlon, duathlon, and archery). What I have learned since 2014, in archery as well as triathlons, is no one is really looking at me. Most shooters are focused on their performance – not mine. The only person looking at me was the one with the camera. Learning to control and handle the excitement of an archery event is vastly different than that of a race, yet with a lot of similarities. 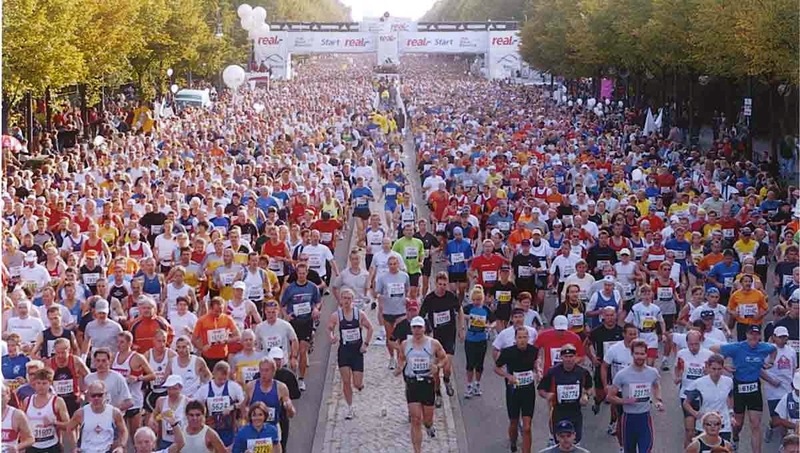 Running a marathon you can rest assured there will be a point where the race becomes increasingly mental. 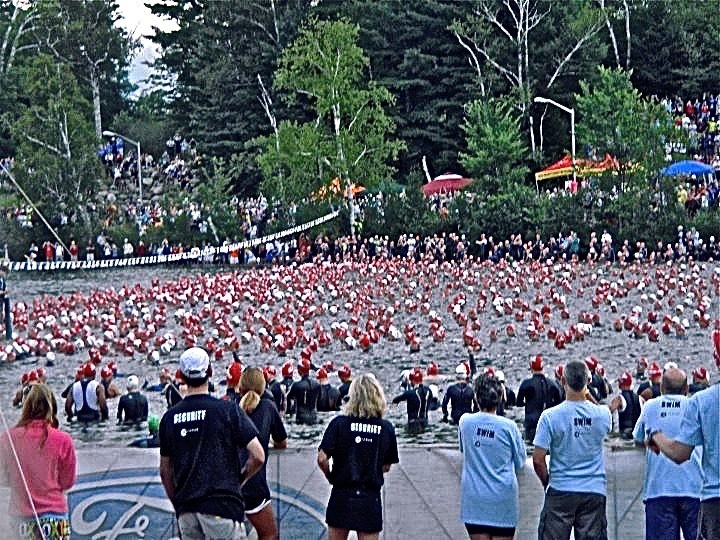 In an Ironman (140.6 miles of swimming, cycling and running) if you are not mentally tough, you will not complete the distance. In archery, mental toughness is a lot about control. You can’t control what is going on around you in a tournament. 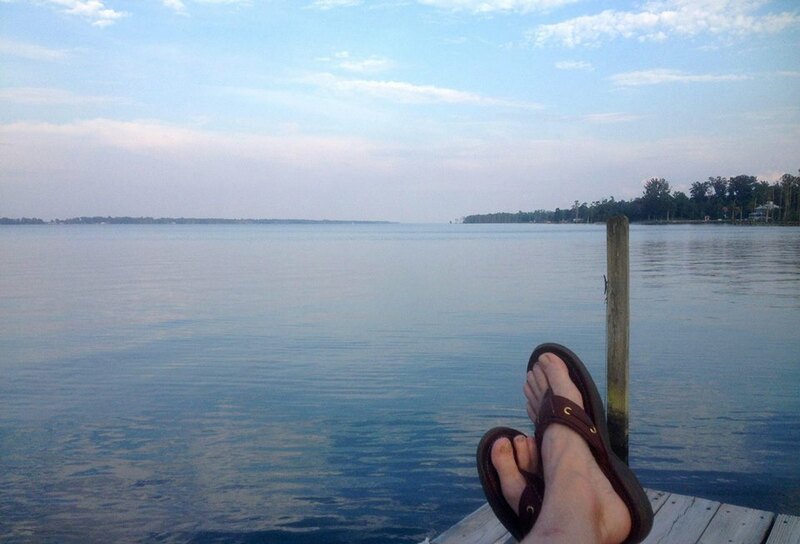 You can control how you react to conditions and unforeseen developments. How you handle them will impact your shooting and you can control your performance. There are days when I practice and I am in a zone. Thus far, I have only been in a zone once during an archery tournament. It was a 3D shoot, I didn’t shoot a perfect score, but there was a smooth relaxed feeling to the shots. During another tournamnet I was nearly that zone where mentally I was on my game. I say nearly since I didn’t feel ‘it’ until I’d shot several targets for 10’s and an 8, before I started hitting mostly 12s. That’s not imply I am smokin’ it at tournaments, at least not yet. I’ve screwed up at major events, missed targets at 3D shoots*, and smacked 8’s at 18 meters in competition after not hitting one in practice for weeks. For certain, you can’t control who you end up standing next to and standing next to a giant was different. I expect I’ll shoot more tournaments like those in a few more months. Some will be better than others. It takes experience and confidence to improve. Practice helps. Pressure during practice also helps. It helps build confidence, which later will aid in support of control. When I trained for bicycle racing, I nearly always trained in a group. There was always pressure. 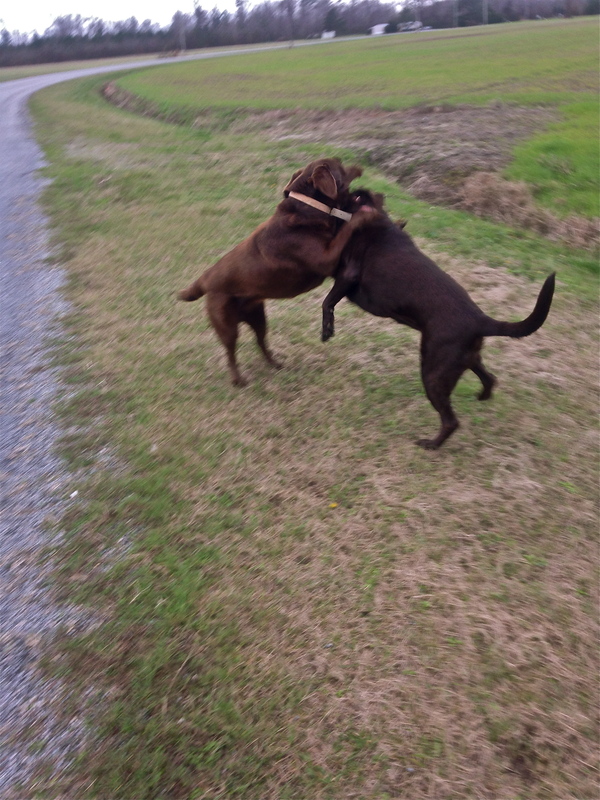 There was always someone trying to break away or someone trying to be the best during any given training exercise. We used to say our training was harder than racing. 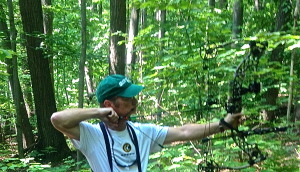 In learning to shoot a bow, I have applied, where possible, training techniques taught to me by my former coaches. These coaches were from: running, swimming, cycling, and football. I’ve applied parts of what I know as a sports scientist / physiologist / sleep specialist and respiratory therapist. Every little bit has helped. However, there’s the element that can only come with experience. During the past two years, since I began this archery adventure, I’ve competed in 43 events in eight states. The experience of those events has improved my confidence. But, I also now know what I can expect to score from each competition. I don’t go into any competition blind as to how I will perform then hoping for the best. I can’t control how others shoot, but I can control how I shoot. With each competition, I aim to shoot a personal best. In order to do that I must be able to control the reaction of my central nervous system, and without that explosive outlet I get from racing. 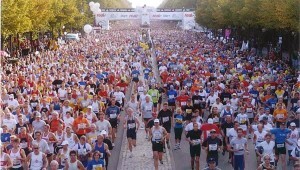 And at each event, I like to know my starting point, that is what are my average scores for this type of event. Then, I set a goal, each time, to walk away with an improved score. Afterwards, I head home and relax for a while. 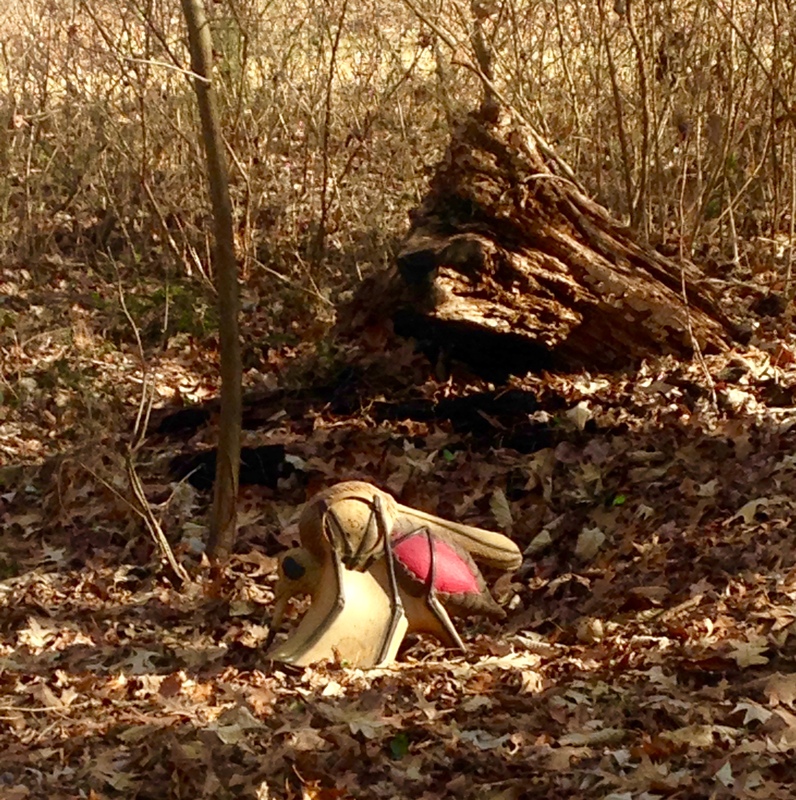 Notes: * Out of 410 3D targets I shot at in 2015 I missed three. A coyote at 35 yard (undershot), a mountain lion at 42 yards (undershot) and another mountain lion steep downhill at 37 yards (shot it in the spine and the arrow did not stick.). Each time, I was embarrassed and each time the guys in my shooting group did their best to outwardly show that silent support. I expect inside they were either laughing or thinking “What an idiot.” But, hey – I can’t control that. The weather has been pretty bad lately. It is still cold, 17°F (-8°C), and windy but the sun is shining. Doing just about anything outside means getting cold. Today, I got cold. Fortunately, I was only really cold while pulling arrows. 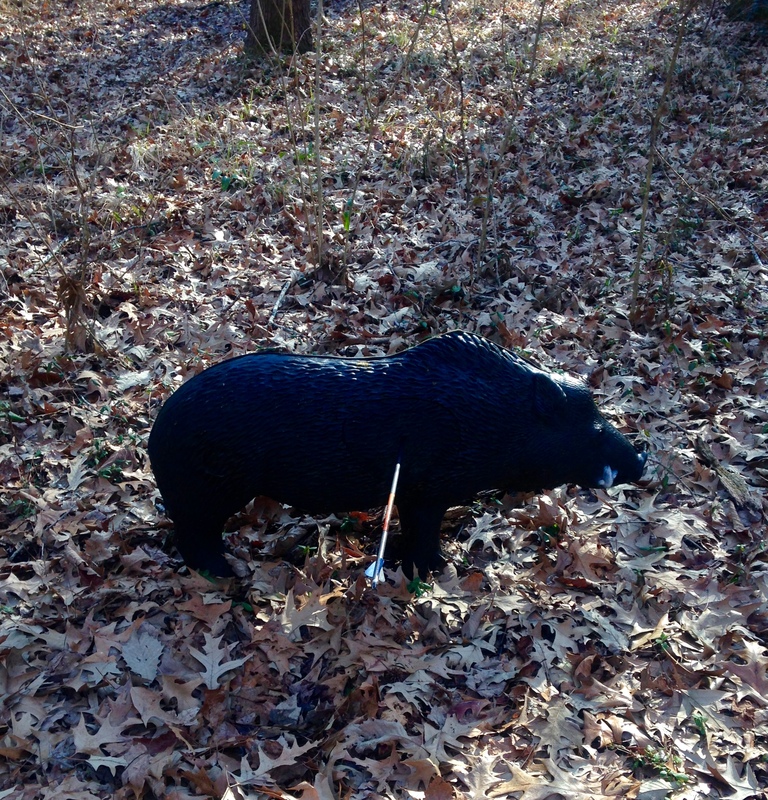 I shot from a heated shed out toward a 3-spot target. Living way the heck out in the country has advantages. 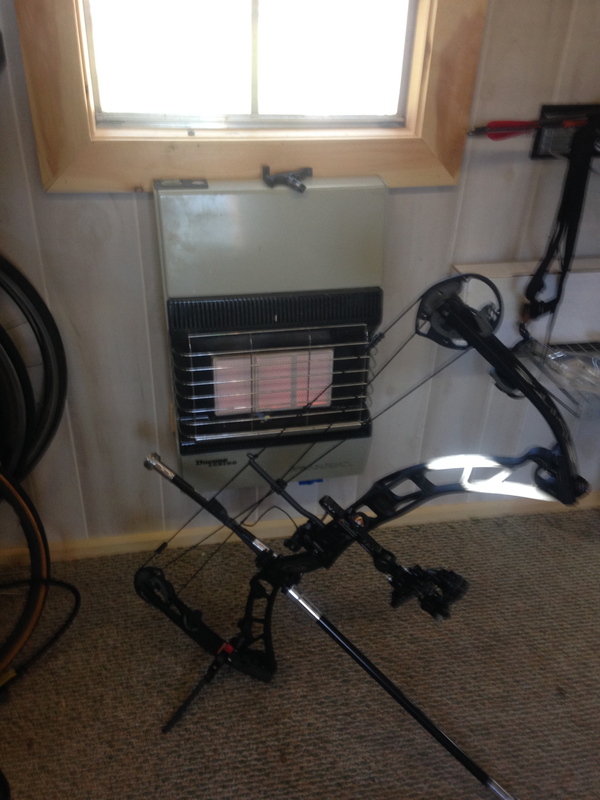 Nice and warm – warming my releases as well. What I worked on today was my release. I have three different releases, two hinge and a thumb. I shoot them all about the same. 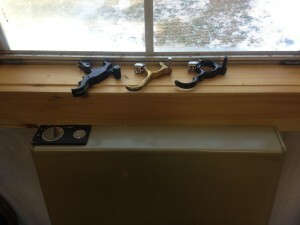 I think if I could get the point of release just right for a hinge that would be what I would use exclusively. But, I continue to go from bad to worst whenever I mess around with either making the release lighter or heavier. Of the two hinges I am using, they’re both mostly right. One is a little heavy; the other is a little bit heavier. Neither is perfect. I’ll mess around with them some more at a later date. I rather just shoot, which means I fall back to using my thumb release. As thumb releases go, I have an inexpensive product, but it seems to be set just right. But, it is easy to get lazy with a thumb release and screw up shots. Aside from dealing with my releases I have been working with the grip on my Elite 35. I do not like the feel of the grip. There are after market grips that can be switched on the Elite. They aren’t cheap and I’m not willing to pay for a test drive. So, I did what is probably the least expensive and best thing to get a better feeling grip. I wrapped it with bicycle handle bar tape. Bicycle handle bar tape. 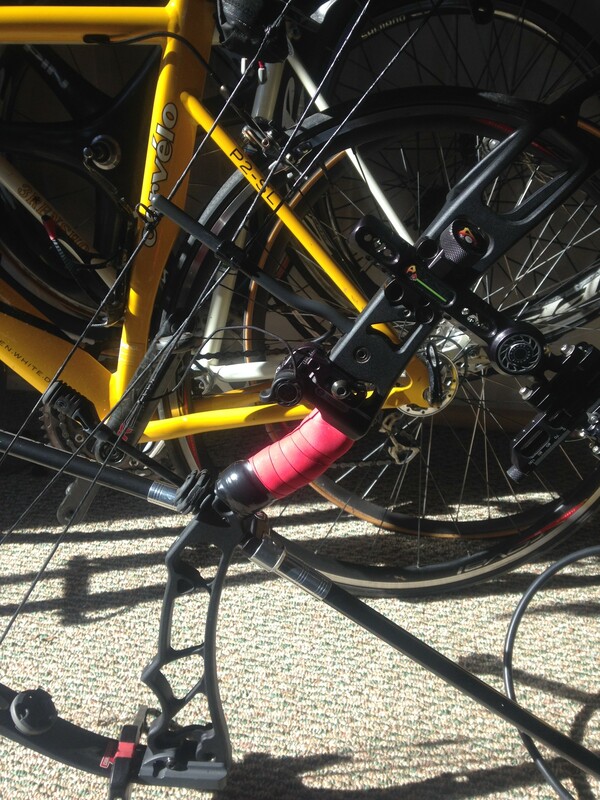 Cycling tape helps reduce the shock of vibration from the road that is transferred to handlebars. It ought to work on this bow. I spent a few hours shooting and practicing with the newly taped grip and rotating releases. The tape felt nice, the releases just felt like the releases always have – no one of them is a clear winner. 3 tens, 3 different releases. 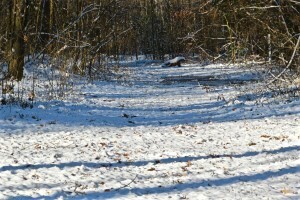 It was still cold when I finished shooting. I closed the door to my shed and spend an hour on my Comptrainer. As I pedaled I watched Miguel Indurain win the 1992 Tour de France on DVD. Then, headed to the Y in Elizabeth City to lift weight and swim while Brenda, my wife, did her cardio-weight lifting work. For the romantics out there, yes this is Valentine’s Day. We celebrated yesterday because Brenda wanted to get in a workout today. She’ driving to Atlanta on Monday and felt this might be the last chance she’ll get to lift weights for the next few weeks. Despite the cold, it has been a very active and fun day to play. 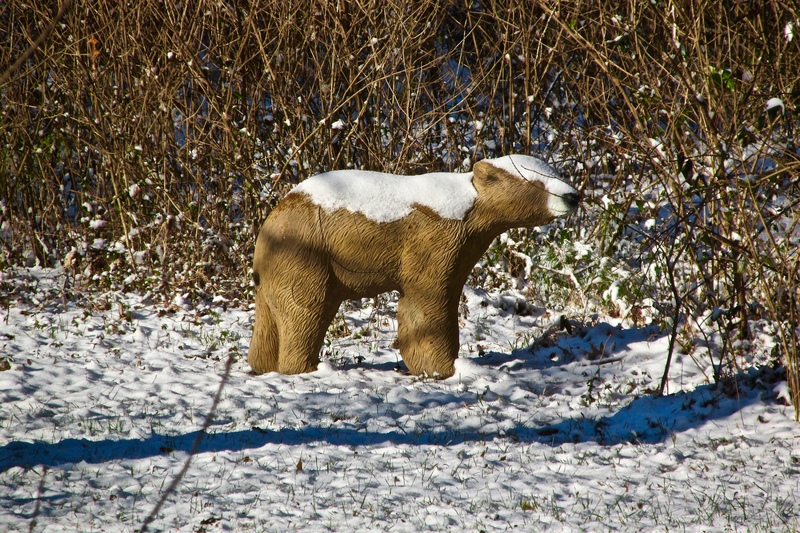 We get a little snow here in New Hope near Hertford, North Carolina during the winter. Not much, nothing like Pittsburgh or Cleveland where we’ve lived in the past. 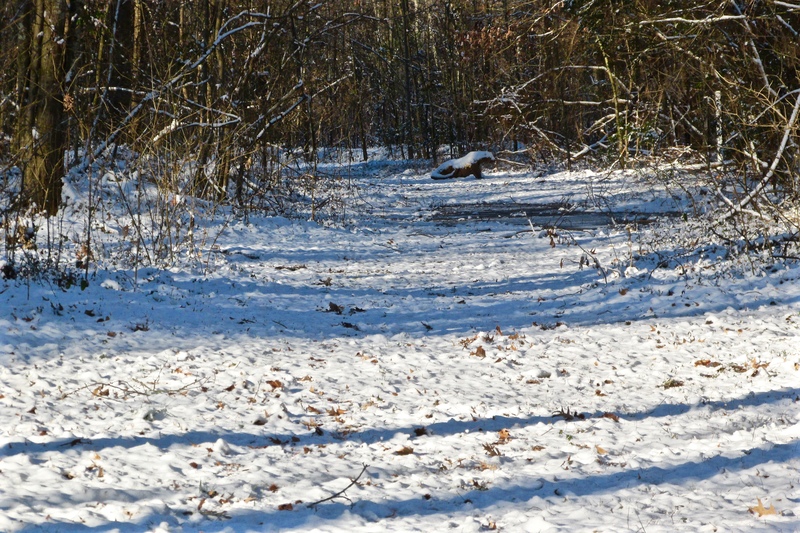 The winters here are springlike compared to Uppsala, Sweden where I’ve worked during the winter months. But, I’ve heard from friends back I my hometown, Savannah, GA the temperature is 67°F. That sounds nice. Despite the weather, unless it is really horrible – for instance a hurricane – we are always getting outdoors. I expect all the snow will be melted within a few hours. 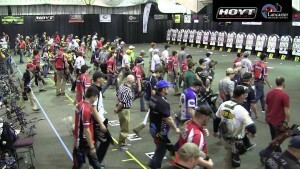 Recently, I competed at the “Soul Hunters” Indoor 3D tournament. 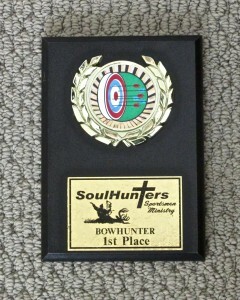 The Soul Hunters, in Elizabeth City, NC is a sportsmen ministry. 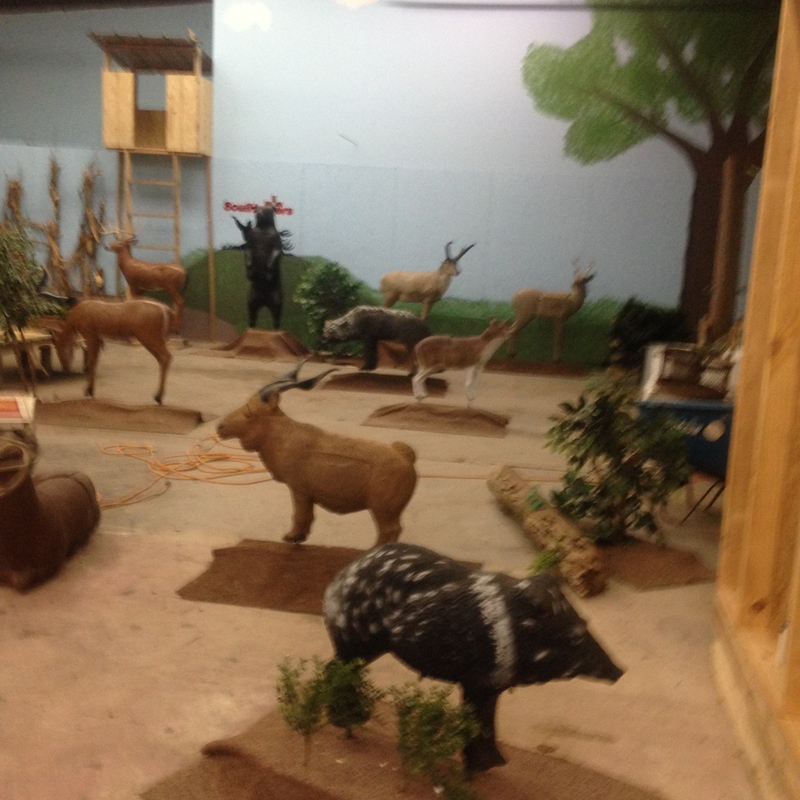 They also have an archery club that is a member of the Down East Archery Collation. The Soul Hunters have frequent 3D competitions nearly year round. When the weather is warm they have an outdoor 3D course. 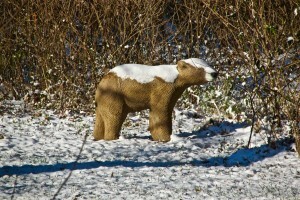 During the coldest part of the year, they move their range inside. One thing for certain, and perhaps it is part of their ministry; their ranges and targets are so tough you may find yourself praying for a good shot. Outside their target set-up is always a challenge. 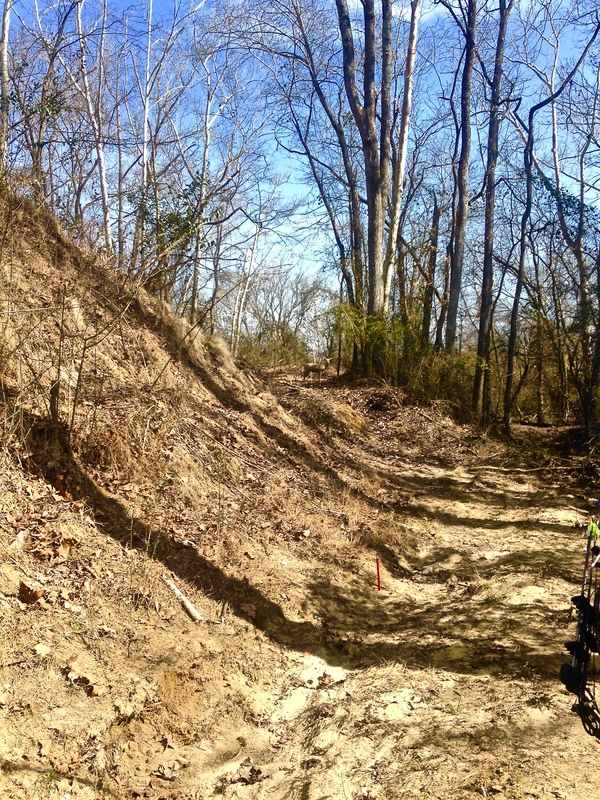 Frequently they’ve set-up small targets in dark holes or on the opposite sides of ditches, mounds and ravines. It isn’t too often a matter of distance; it is a matter of judging the yardages under difficult terrain that makes their range hard. Their indoor range is the epitome of short-range complexity. Outside using a scope is fine on the Soul Hunters range. Inside – the scope is nearly worthless. The longest shot is only 33 yards. 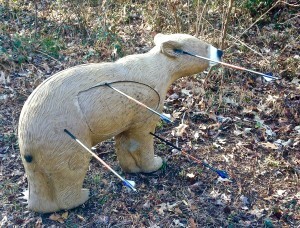 The closest is around 12 yards. The animals are arranged in 5 columns with four shots per column. The difficulty comes in the arrangement of the targets – everything is tight. To add to the difficulty the lighting isn’t great making everything hard to see. What happens is that you find yourself shooting through narrow lanes and small openings. Recently, they’ve added a “bonus” shot. Typically, a bonus shot is one where archers hope to make up points. Their bonus means archers mostly hope to hit the target. The bonus is a mosquito mounted on a tree, sitting between branches, 27 yards away and up about 6 feet. I’ve had a horrible time in the past on their indoor range. Using my scope, and its black dot center on the lens, in some cases the shot has been almost pure guess. Basically, I’ve set the sight to 20 yards and moved the dot up and down leaving the elevation set at 20 yards. I’ve done OK like that but never winning. I’ve also shot really, really poorly using that technique. 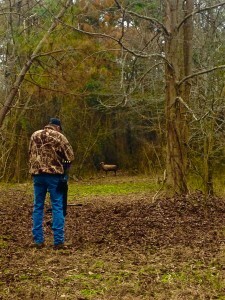 Setting up the range – before trees and bushes are arranged. This most recent tournament I decided to pull off my scope deferring fixed pins and a short stabilizer. It made all the difference. The targets are the same distance for all adult classes. Kids get to move up a few yards. With the pins, I could see where I wanted my arrow to land. And this time I finally shot well. In their prior competitions I finished third twice and second twice. This time I took first place against some very good archers. As always, the Soul Hunters drew a crowd of shooters. The warehouse that is used for the indoor range was packed. For sure, this group of heavenly people can certainly put together a devilish course. But, everyone seemed to have had a great time shooting – despite a lot of arrows smacking in the back wall, bouncing off the floor, or hitting the wrong target. At the Y today I met a fellow from Michigan. He and his wife are retired schoolteachers. They moved to Elizabeth City, NC to be closer to their daughter who teaches in Chesapeake, VA. 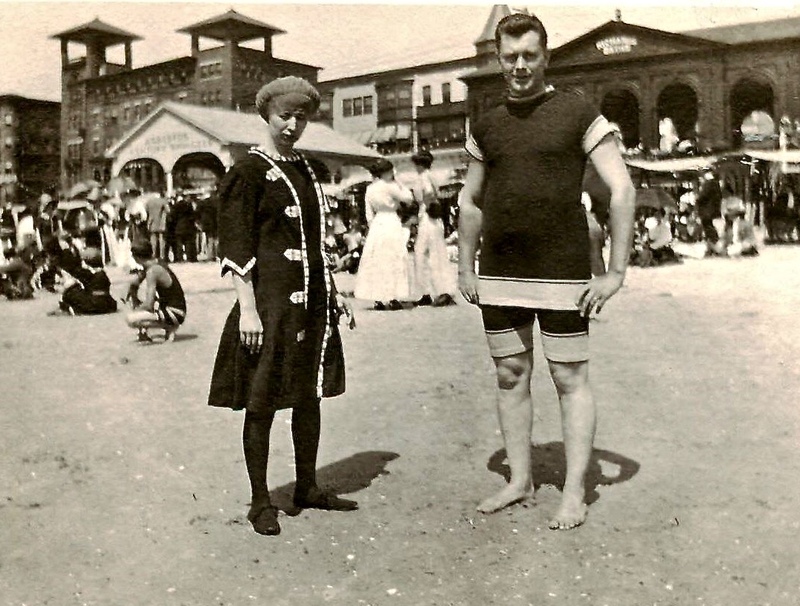 The fellow was preparing to swim, as was I, when I noticed he was wearing a one-piece triathlon suit. 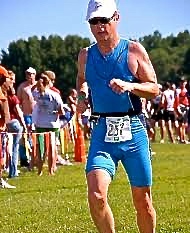 Me running in a one-piece triathlon suit. They’re designed to be used in the swim, bike and run without needing to change apparel. 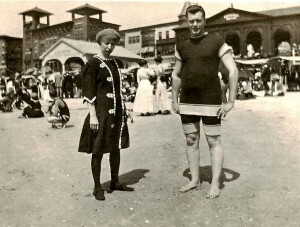 These suits are one-piece sports apparel that look a bit like the old swim suits of the late 1800’s. They are sleeveless tops connected to the short bottoms that zip up the front. When I noticed what he, Randy, was wearing I asked if he was a triathlete. He said yes even though be was built more like a wrestler. In fact, I learned he had been a wrestler when he was in school. As a teacher, he taught math and physical education (two of my favorite subjects). I further learned Randy, is 65. I have another friend, Paul, who is 76 and training for an Ironman. What I’m getting at is this, there are a lot of senior athletes training and competing at a high level. 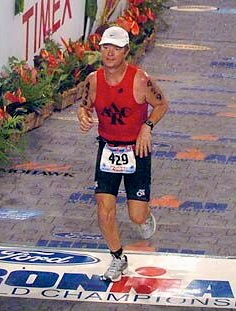 A friend of mine, Bruce Buchanan has seven Ironman World Championship age group wins. But, he’s not famous like the pros that have won 6 times or even twice. Heck, even his finishing times weren’t much off the top pro times – and he’s beaten more than one pro. Unlike the pros he’s beaten he was a full time periodontist (now retired). 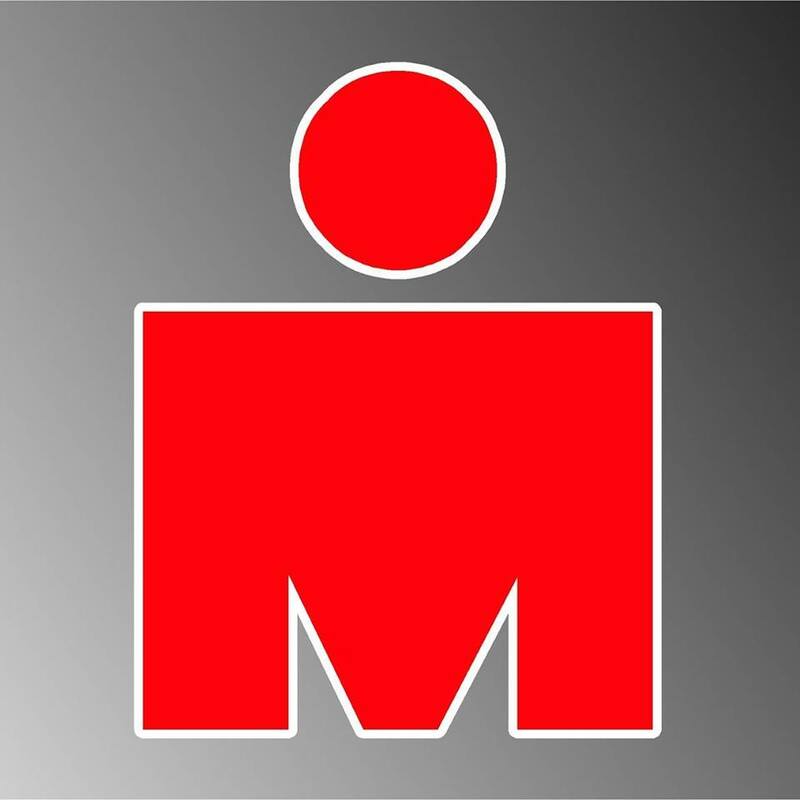 Randy and Paul may never win an Ironman World Championship. But, they’re out there putting it on the line. 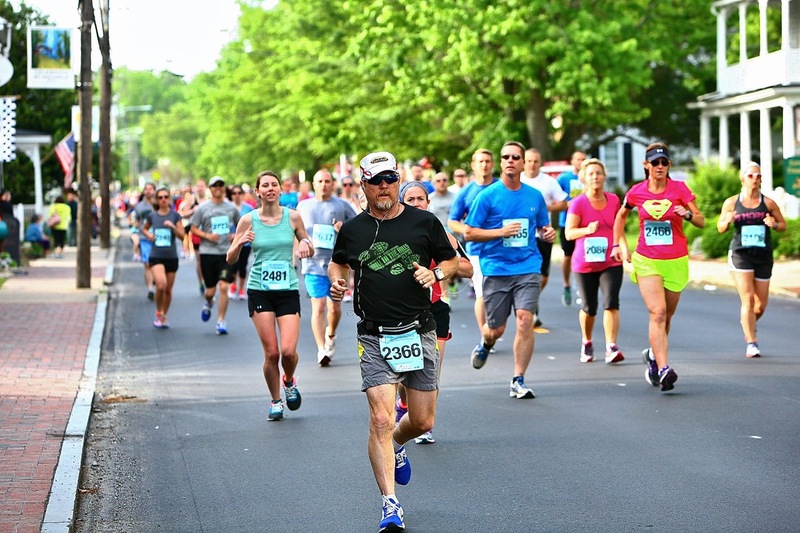 A number of bonuses come from being active in sports: feeling better, looking better, sleeping better, becoming healthier, and improved cognitive function to name a few. Enjoying sports and working out is not just for kids and young people. Randy, Paul, Bruce and only examples of a significant population of folks over 50 that are finding ways to stay active and become involved. I certainly appreciate their efforts.